Self explanatory title so let’s get this show on the road. DO: everything in your power to meet people. The first weeks of school are all about meeting people and making friends. Say hello to the people on your hall as you move in. Keep your door open while you unpack. Go to a club fair and meet people with similar interests. You don’t have to be best friends with every person you meet (or even talk to them two weeks from then), but you’ll never meet new people if you don’t start somewhere. And everyone is doing the same thing. Everyone is trying to meet new people. You are not alone. DON’T: go home. Do not, I repeat, DO NOT go home for during the first few weeks of classes. You may get overwhelmed and running home for a night or two may seem like the best decision, but don’t do it. You need that time to learn and grow and get comfortable. Also, the first few weeks of the semester (especially the weekends) are when everyone is being social and making friends. If you leave during that time you’ll inevitably be missing out on the most important social time of the year and may find yourself being among your peers. DO: keep up with your parents. There are several reasons this is important. For one, if you don’t there is a large chance that they will stalk you down and text/call you multiple times a day and you don’t want to be that kid who is constantly talking to their mom and dad. Secondly, they are your parents. There is a good chance that they are paying for your education, and even if they are not they raised you and took care of you for 18 years and you just should. Kay? Kay. DON’T: spend all of your time with the same person. Whether it is your roommate or best friend or SO, doesn’t matter. Do not spend all of your time with one person. You’re missing out on meeting new people and it is likely that that person will make friends even if you don’t and you’ll get left in the dust. However, DO: befriend your friend’s friends. I can’t even tell you how many friends I have made through my roommate and visa versa. Mutual friends are fantastic because you probably have similar interests/personalities if you have a lot of mutual friends. DON’T: think you have to have everything figured out. You have four years (and even after graduation honestly) to figure out who and where you want to be. Don’t rush it. Don’t freak out. You don’t need to know your major from day one, take some classes and test the waters and see what you like. Give it time for everything to fall into place. The transition to college is hard enough, don’t put extra expectations and pressure on yourself. DO: try something new. Go to a club fair. Join a club or intermural sports. Even if it is something you have never done before. Try. It’s a great way to get involved, stay active and meet people. DO: use the ‘free’ resources on campus. They’re not actually free because you pay for them through tuition and fees, but use all of the ‘free’ resources that your university provides while you are a student. This includes everything from career services, to healthcare to sporting events. These are incredible gifts and get your most for your money by using them during your time as a student. But DON’T: go crazy. Of course college is a time for breaking out of your shell and finding yourself, but take it from a pro, you’re not going to find yourself (or at least not your real self) at the bottom of a bottle. Drink, have fun, be merry, but be smart and take care of yourself. Do not disregard your values. Don’t change who you are. Be you, grow, blossom, be amazing. That’s what it is all about. It all happens in the blink of an eye. You make one of the biggest decisions of your life at 17 or 18 years old: where are you going to spend the next four years of your life? The decision isn’t easy, there are many factors involved, but that’s a whole other post. If you’re reading this, you’ve already made the big decision….CONGRATS (insert 30 second dance party). Now. While you’re probably acting all cocky and macho because you’re one badass who is totally ready for all the college-y things in your future…you’re probably actually scared as hell. And to an extent…you should be. You’re moving out of your parents home. You’re going to be in charge of your own education, wellness and all of that jazz. It’s new, it’s big, it’s scary, but the first thing I want to tell you is: you’re ready. The scariest part of college is that everything seems unknown. Maybe you’re worried about making friends or how hard classes will be or how to live with a roommate. There are probably a million scenarios running through your head. And when you’re worried or anxious, what helps more than a stranger on the Internet telling you what do? 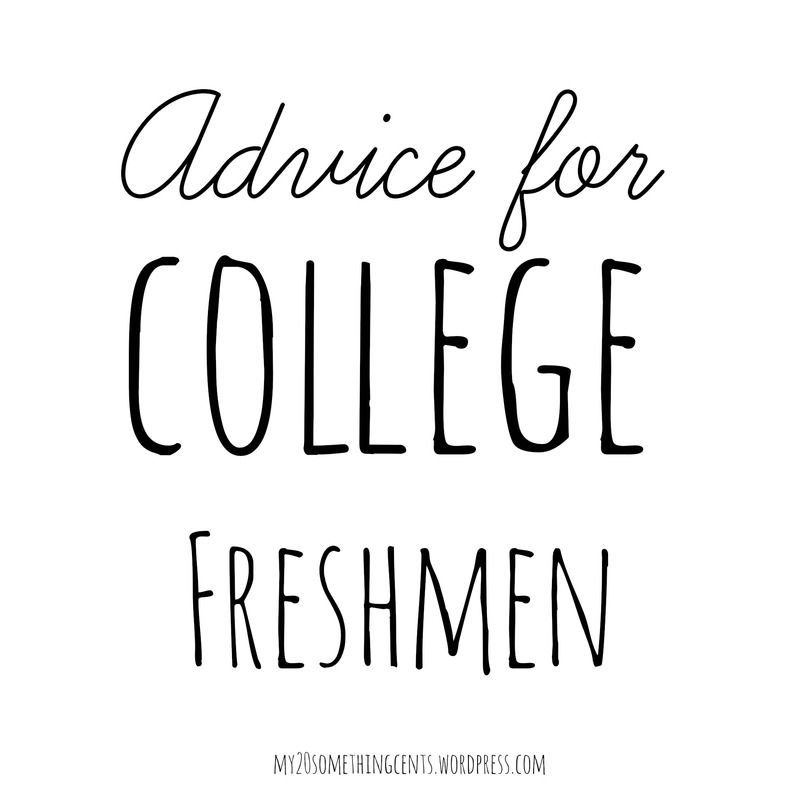 But on the real, I am really looking forward to my first multi-part segment on advice for college freshmen (ahhhhhhhh wooooooooooo). I have several posts planned for the next couple of weeks that will dish out pieces of advice I have accumulated in my two years of college. Hopefully some part of this information can reach someone and give him or her some reassurance or help or advice in any way. Check back in the next couple of days for the first post: Do’s and Don’ts of Freshman year. Can’t wait for all the nostalgia and excitement, because TBH I wish I could be a freshman forever…. (YOU CAN’T MAKE ME GRADUATE…YOU CAN’T). K. I’m tired and I need to stop typing now. bye.